In this installment of the “Start or Sit Rankings,” I have added additional information that will help you in making your Start/Sit decisions easier. The main intent of this series is to give you a better idea of who will be a fantasy stud or fantasy dud in each respective week. IDPs are ranked on a scale of 1-5. With 1 being almost non-relevant and 5 being a near shoe-in for a huge game. 1 = almost non-existent in the stat column. 2 = will make a play or two, but cannot be trusted for steady numbers. 3 = pretty much your average player, won’t wow you with stats. 4 = will put up above average numbers with some upside. 5 = an absolute beast you can count on for a big game. The Offensive and Defensive Passing and Rushing Rankings are from Yahoo! Sports. 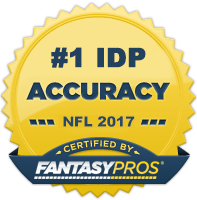 This information will allow us to more accurately predict weekly IDP performances based on matchup which is starting to become crucial with bye weeks upon us. Team Tackle Chances have been taken from Yahoo! Sports as well. The numbers are generated using the Offensive Teams Total Completions and Rushes, then dividing that number by the number of games played. This is a great tool to show you how many chances per game your IDP will have at a tackle, which for most leagues is one of the more important indicators of potential fantasy success. Any suggestions for the “Start or Sit Rankings” are always welcome. As always, please send in some feedback, let me know what I missed and what I hit on.